Amazing Tamable Animals (Apologetics Press) is one of six in the Advanced Reader series. The lion may be “the king of the jungle” and the elephant may be the largest land animal, but man has tamed both the lion and the elephant, along with many other animals. 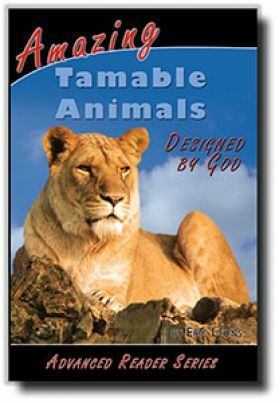 Amazing Tamable Animals (Apologetics Press) is one of six in the Advanced Reader series. The lion may be “the king of the jungle” and the elephant may be the largest land animal, but man has tamed both the lion and the elephant, along with many other animals. Homeschooled children will enjoy perfecting their reading skills in this most entertaining Advanced Reader. For a special price, click on the Buy Together tab.